Provide comfort for the family of Rita Moffitt with a meaningful gesture of sympathy. 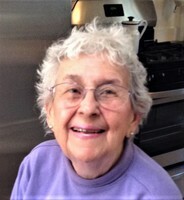 Rita Marie Moffitt, 86, a former resident of East Road in Bennington, died peacefully Monday, April 8, 2019, in the presence of her children at the home of her daughter Debra in Great Barrington, MA. Born in Swanton, VT, on August 12, 1932, Rita was the daughter of the late Alcide T. and Marguerite (Boucher) LaBrie. After Marguerite's passing, her father married the late Olivette Gagne in 1938. She received her education in Swanton and was a 1951 graduate of Saint Anne’s Academy. In earlier years, Rita was employed at Flint and Robbins and Eagle Square Mfg. She retired, in Bennington, from Eveready (Energizer) where she had worked for more than 26 years. Rita married Gerald Moffitt on September 25, 1954, at Sacred Heart Church in Bennington. Mr. Moffitt died February 18, 2009. She was also pre-deceased by her son James G. Moffitt, her brother Laurent LaBrie and her sister Annette LaBrie. A member of Sacred Heart Saint Francis de Sales Church, in Bennington, Rita enjoyed gardening and knitting. She also enjoyed camping and card games with family members. Survivors include a daughter, Debra des Cognets of Great Barrington, MA, a son, Brian Moffitt and his partner Christine G. Adamo of Rochester, NY, and daughter-in-law Leslie Gartrell-Moffitt of New York, NY; grandchildren Nicholas des Cognets, Aliza Jayne Moffitt Fegan and Damien Moffitt; brother Roger LaBrie, and his wife Yvette, of Essex, VT; brother Gerard LaBrie, and his wife Pat, of Highgate Springs, VT; sister Jeannette Butler, and her husband John, of Bennington; sister Dolores Norris, and her husband Peter, of Monkton, VT; and several nieces, nephews and cousins. At Rita’s request, there will be no calling hours or funeral services. To send flowers in memory of Rita Marie Moffitt (LaBrie), please visit our Heartfelt Sympathies Store.